The Townsville Theatrical Society's latest presentation— one of the finest yet seen in the city-was enthusiastically received by a large house in the Theatre Royal last night. 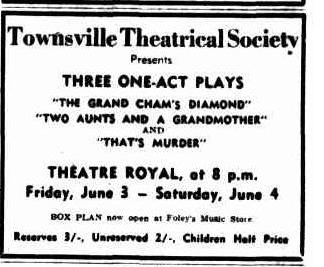 Of the three sparkling one-act plays, 'The Grand Cham's Diamond' dealt with crime in doubt, 'Two Aunts and a Grandmother' with crime in jest, and ‘That's Murder' with crime in earnest. Lettie Mills, in a small character part in 'Two Aunts and a Grandmother,' demonstrated again the flair for comedy she showed In 'Ladies in Waiting' some time ago. Acting throughout was of a high amateur standard, and in all cases the players should be greatly benefited by this experience. Of the other players, Judith Melrose, Jean Holliday, Mattie and Mavis Mercer, Mary Summerfield, and Janice Hamilton and William Wynn were particulary good, although that does not imply that the rest of the casts did not carry out their minor parts well. It would be interesting to see what this society with its wealth of talent could do with a really serious play. Until now they have presented almost exclusively comedy with only one act excursions away from it. A serious drama would be an excellent challenge for them. Last night's plays were produced by Ryal Costello, Patricia Pearse and Eric Rees. Incidental music was supplied by Mrs. Summerfield's orchestra. The society presents its programme again finally to-night. Main Players: Judith Melrose, Jean Holliday, Mattie and Mavis Mercer, Mary Summerfield, and Janice Hamilton, William Wynn, Lettie Mills. Incidental music was supplied by Mrs. Summerfield's orchestra.